Only 16 Days to Go and I am Soooooo Behind! The TWELVE embarrassing pictures of Christmas~past! The ones that didn’t make it. For obvious reasons. Left: I was an angel (both as a child and for this photo shoot) but my mom cut my wings out of the shot! What the heck? I see I must have been making THE pronouncement over Baby Jesus (aka little brother, Danny), as I seem to have everyone’s rapt attention. 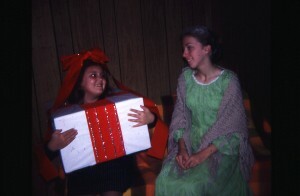 The set was created using bathrobes and towels, a bassinet and my aunt’s old prom dress. Just 5 sweet children getting ready for bed the night before Christmas. Right: We got the pooch in on this one, which, I guess, is why I got placed in the background. Hmph. Scenario: My mom used crayons to draw an outdoor backdrop on a white sheet. She dragged an old storm window frame in from the garage and attached some drapes to it. Then she used the red towel to cover a dresser and set a Biblical vingette as though some one was looking outside (from inside their cozy, warm and very spiritual home) at these little children sing. This is WHY Photoshop was invented: to help creative photographers like my sweet mama. BTW~these were AFTER church on a Sunday night, which followed church on Sunday morning, that had followed Sunday School before that. I recall being veeeeeeery tired, at half past 10 p.m., it was sooooo flipping hot in our coats and hats inside the house and my mom just would not quit. Left: Though nearly ruined by water damage in some humid state or another, I feel this was “the one!” I mean, I am obviously truly singing, Tami is smiling cute! Tim is singing his head off, even though he had the little Carol book turned inside out, you can practically read the Bible (turned appropriately, I am certain, to Luke’s Gospel. chapter 2). It was a good one. Right: Danny is crying and Tim is thinking about it. Tammy and Joe can’t keep their eyes open, and I am in a preacher’s kid-after-Sunday daze. Let us go to bed, already, mom! I love you anyway, mamala! 2. If I was supposed to be Joseph, where was my tool belt? This blog is possessed…I just can’t write here anymore! Aww. Those pictures are awesome! I just can’t believe how hard she worked for them! Also, the last pic on the left of you as an old lady looks so much like me and my profile. WEIRD! All I can say is HAHAHAHAHAHAHAHAHAHHAHHHAHAHAHAHHAHAHAHHAHAHAHAHHA!